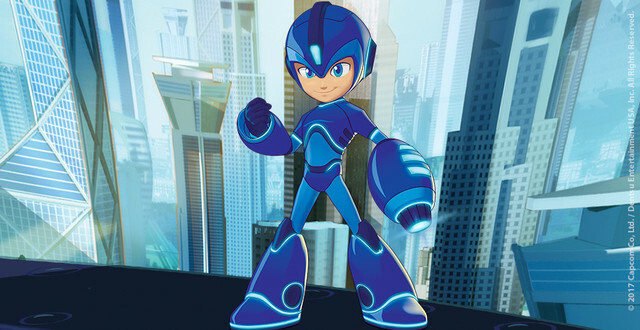 Jakks Pacific has won the master toy license for next year's new Mega Man cartoon, according to Licensing.biz. The deal between Jakks and the shows producers - DHX Brands and Dentsu Entertainment -includes a range of products, from action figures and play-sets to costumes and plushies. COO Jack McGrath says, "I grew up with Mega Man and am a big fan, so I’m thrilled for Jakks to team up with DHX Brands and Dentsu on the new animated series. Jakks will bring to life the characters of this terrific franchise through a wide range of toys and costumes for a new generation of kids." Mega Man is expected to air in 2018 on Cartoon Network. Production heats up this summer. Here's what I'm hoping, since this thing doesn't seem to be getting cancelled any time soon, I'm thinking it could bite off more than it can chew and not deliver (to investors) and have a short forgettable life as a result. Yes that's selfish, yes that's think about my preferences in what I know to be quality true to the brand content, I don't care. I'd rather see MM rip than badly represented. Also it's not like I am actively trying to stop the people wishing for this to succeed or the project itself (part of me even wants it to be good, but from everything I know it'd be naive to think it will end up differently than what I expect), so yeah all I'm doing is hoping is my wish cancels out your wish in this case. man or you could let kids have fun and enjoy a new show from a different angle that leans towards their interests too. Megaman isn't just for adult audiences who grew up with the game, it's for anybody who enjoys it--be it just the merchandise, comics, video games, tv shows etc. Let kids enjoy something that's new to them, let these guys be the ones to bring that around. I'm excited for a new show. I'm excited to see what others have to bring to this franchise that's been quite nonactive for a long time. And I know they're working at it. I have hopes for this--not for it to go sour, but for it to get others interested and learn more about something that's really cool. Translation: I don't like it and I don't think you should so I want to undo your positivity. Not speaking for the other guy, but I have no problems with the show being catered towards kids. My issue so far is that the little bits we've seen look straight-up BAD so far. Even though I'm skeptical of this series being good, what you're saying isn't terribly different than the people that disliked the Archie Comics. Different forms of the franchise appeal to different people, and even if we don't like it, that doesn't mean it won't have its own fans. So I'd say that instead of wishing it fails, we should instead wish it succeeds. After all, even if the series isn't the best in the world, it might still encourage kids to look up more about the rest of the franchise and generate interest that way. Neither wish will affect the real outcome, so might as well look at the positive side of things. I'd normally agree with you guys, if I wasn't convinced that this cartoon under performing is the excuse Capcom needs to really bury the franchise. Damn, after seeing Castlevania, and comparing it to this makes me all kinds of depressed. The same director has an interest in making a Mega Man film with a mature tone, so that's something to keep in mind. If Castlevania goes over well, which I think it will, then we'll probably see that Mega Man film come to life. @Unknown: Why does it need a translation? people can't read two small paragraphs is direct plain English? "it's not like I am actively trying to stop the people wishing for this to succeed"
To mean Anon wasn't trying to dictate what others should or should not want, and is operating on the premise of personal wants alone. If anything if you're against that stance you're the one that thinks Anon1 "should" like something, since Anon1's is personal and yours is a public reflection. Uh...I don't really want Mega Man to have a "mature" tone, to be honest. Can't we just have a nice middle ground? While I think the artwork is not quite faithful to the original, we should wait and see what the finished product looks like in action. I look at shows like Teen Titans that radically redesigned the characters and delivered an excellent product. Honestly, I feel like Megaman needs a makeover to appeal to a new generation. Sorry, but trying to please the 'retro' generation is not going to keep him alive. I actually kind of disagree, but only to an extent. A redesign similar to the Smash design I feel appeals enough to both new audiences and retro fans. Which is for the best as the Classic Mega Man never really got a fair shot at appealing to mass audiences as it was never promoted particularly well. So they are trying to do a cash grab similar to the Ruby-Spears series by adding a toy line and (presumably) other merch. I guess that's OK in the context of Capcom's bottom-line, but THE SERIES NEEDS AS SUBTITLE. The Ruby-Spears series tried to fit into the existing Mega Man universe for the most part, and it was OK to call it simply "Mega Man" in my opinion because the series didn't change the existing Mega Man formula too much. However, this new series is changing everything, and it needs some way to distinguish itself from the existing Mega Man continuity. I mean, even though Sega has a track record of making really bad decisions, they were observant enough to realize that Sonic Boom was different enough that it should not be called "Sonic the Hedgehog". I wish Capcom was similarly astute. The one thing that would be a real slap in the face though would be if Capcom made a *game* based on this new series and called it "Mega Man". Anyway, we'll see how long this drags on before Capcom scraps it. They have a short attention span when it comes to new IPs, so I would be really, really surprised if it lasted longer than a season or two. Regardless, I can't foresee people looking back on this new series and speaking too favorably about it. The big question is whether people will think that it is worse than the Ruby-Spears series. So, that means that the next Mega Man game will be a "Plug&Play"? I was just thinking that. Heh heh. I am fan of Rockman and this artwork is so Americanise and I hate it. No thanks. Japanese anime is the best! Japanese anime is the best? Too bad NT warrior which was an anime was junk compared to the actual games. I'd take the ruby spears show over that. At least had both an American & Japanese contribution to it. The new look is growing on me, especially thanks to the superior artwork. (Not superior as in, superior to everything ever, but definitely superior to the announcement image.) Hope it ends up good. I'm still bummed that I'll probably never get closure to the "real" Mega Man games, but oh well. Maybe someday. i am honestly interested in seeing where this goes, it will be like meeting an old friend for the first time again. i just hope it's not as bad as that Pac-Man cartoon that aired on Disney, man was that horrible! "I grew up with Mega Man and am a big fan […]"
Then why are you so excited about this, Mr. COO? This isn't your "Mega Man." If This succeeds chances are it might tell Capcom that people still want to see Mega Man and I don't know, try and roll out the other versions of Mega Man evencally, and maybe even bring Classic? I don't know I'm probably very optimistic just wait for the first few episodes to air before judging it. For anyone hoping for this cartoon or any anything else not perfectly to your liking to fail,please go be a fan of another franchise. Liking the cartoon is not a test of whether you are a real Mega Man fan or not. (Technically this cartoon isn't really Mega Man anyway since Aki Light is apparently not the same character as Rock.) For me, I just think that Capcom could have made better decisions than this. Personally, I would rather see Capcom use their money to hire IntiCreates to make another ZX game instead of paying people to make this atrocity. Actually, I would be OK with Capcom having these people make a ZX cartoon and toy line if it meant that we got a new ZX game. If your mission statement is to make an awful cartoon to sell toys, it's only fitting that the toys be awful as well. Hence, Jakks Pacific. The artwork is ugly. Where is his neck? His head is a giant egg. The robot masters look decent and I'm hoping for toys of those" because toy companies pump out less then ten characters and most of those are mega man in some form. But the biggest sin is changing this from super fighting robot to school kid, ben tenn 2.0. Why? Mega Man isn't human, he's an advanced android. Why change his name to Aki Light. If they were gonna pull the human school kid angle crap, they woulda been better off doing an adaptation of Battlenetwork.